I sporadically used the first bottle I bought, saving it for what I don't know. But the last 2 weeks of the old bottle, I decided I would use it morning and night before deciding whether to order again. One night after the 2 week a.m./ p.m . usage, my husband, who never notices details, said "your skin looks so pretty are you wearing makeup?" I had just washed my face for bed. Well, I couldn't wait to reorder this magic in a bottle and my skin is improving daily. Pores and brown blotches are so much less noticeable and my makeup, when wearing, goes on so much smoother. I even put it around my eyes. Wow! What a difference! For someone with oily, sensitive, clogged and ageing skin this product is a miracle. It soothes, absorbs ( you need to wait a little while) and the gentle acids refine large pores and keep clogging under control.Plus it reduces red marks!I use it morning under a sunscreen and evening under Exuviance Night Renewal HydraGel. I really liked this product. When I use it in the day time I have gotten comments about how good my skin looks and I am 61. It is not sticky. Smooth and soothing, not greasy. I like a bit of shine so I do use it in the day as well as night. I have used other serums that have similar ingredients and they are a little harsher and a little less smooth. Will buy again despite the expense. I have used this for about 5 months and really like it. Leaves a smooth tightening feel to the skin. I can use it around eyes with no irratation.A little expensive but Skinstore runs 20% off and makes it well worth the purchase. A little goes a long way. I was very excited to order this product but unfortunately was extremely disappointed in it. The serum is easy to use, but that's the only positive I can say about it. I found it left my skin feeling very sticky. I tried using a very tiny amount and still it felt sticky on my skin. Furthermore, I did not notice any change in my skin, but to be fair, I could not use it longer than a week. Perhaps if you can deal with that sticky feeling and keep using it, it will eventually give you results.Not worth the price!! This is one the best products I have used on my face. 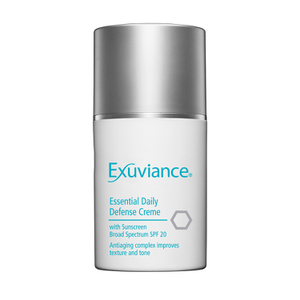 The exuviance line is a great affordable line. Use this first and then put on the rejuvenating complex at night. In the morning use the skin rise tonic under sunscreen. My 51 year old skin looks great! my mom just loved it!!! I have been using this, along with the evening restorative, for at least a year and have great results. All of the Exuviance products are reasonably priced, long-lasting and help this 53 year old look like she's still in her 40's! I think the one negative reviewer didn't like it because she used it in the morning, not at night as recommended. I've been using this product for the last 7 years and am convinced that it has contributed to a younger looking face (along with the evening restorative creme & multi-defense day fluid). I am 35 yrs. old and often am mistaken for 27! I loved the first few seconds of putting this serum on, but the ambience quickly absorbed and did nothing throughout the day to make my skin look good and definately had no lasting effects. I used this for about two weeks and threw the rest away. I felt it was a big waste of money. Try the Exuvience sunrise morning tonic. Its the best on the market. This item needs to be discontinued to help Neostrata save face.